According to the USDA’s latest data, 30 to 40 percent of the food produced in the United States goes to waste. (1) Let’s explore how root-to-stalk cooking can change this! The importance of cutting down on food waste and living more sustainable lifestyles takes on added gravity when we see statistics like the one above. This is where the philosophy of root-to-stalk cooking comes into play! As the name implies, this cooking method is based on the idea that every single part of the plant that can be used, does get used. In addition to reducing food waste, root-to-stalk cooking can also help you tap into extra nutrients and add unique new flavors and textures to your meals. Save your money. Root-to-stalk cooking uses the whole vegetable in its entirety so you can cut back on what you buy at the grocery store or the farmer’s market. Reduce energy consumption and your carbon footprint. 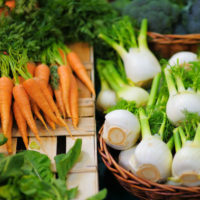 By reducing the amount of produce you consume, you will help cut down on the number of plants that need to be grown, harvested, transported, and refrigerated! Reduce greenhouse gas emissions. By generating less food waste, there will be less food sent to landfills and fewer greenhouse gases emitted as they decompose. Root-to-stalk cooking is also a fun way to get creative in the kitchen and create healthy, wholesome meals. Plus, you can choose local and seasonal produce for even more benefits! Win-win all around! Keep reading to learn about easy ways to get the most out of your produce. Stock up on scraps, then make a veggie stock. Use these: Onion skins, carrot peels, celery leaves, herb stems, green onion ends, leek tops, asparagus stems, or corn cobs all work well. Avoid these: Cruciferous veggies, including broccoli, cauliflower, Brussels sprouts, and cabbage, will impart a strong bitter flavor. Starchy vegetables, including potatoes and sweet potatoes, will make your stock cloudy. Always avoid any dirty, moldy, or rotting veggies! If you’re looking to make something with the starchy veggies you already have in your kitchen, try this Sweet Potato and Carrot Soup instead. Get creative with your sautés. Think outside of the box when it comes to sautéeing your food! Beet greens, broccoli, and cauliflower leaves or stalks, or carrot and radish tops can be sautéed up with a little olive oil. Season with salt, pepper, and your favorite herbs and spices, and use as a delicious repurposed side dish! Cucumbers aren’t the only veggie that can be pickled – in fact, a wide range of other veggies make delicious pickles! Pickling is an excellent way to save those veggies when you have just too many to finish at once. Asparagus, carrots, peppers, beets, cabbage, green beans, and summer squash are just examples of the tons of other veggies that are great when pickled. To add extra flavor, mix in some herbs or spices too! Do you have leftover greens and you’re not sure what to do with them? Turn them into pesto! While basil pesto is the traditional option, you can swap the basil for another leafy green! Instead of basil, pesto can be made with carrot or radish tops, beet or dandelion greens, arugula, cilantro, kale, and spinach. Experiment with different greens to find the one you like best! Check out my new books, The Plant-Based Boost Cookbook, 100+ Recipes for Athletes and Exercise Enthusiasts and The Plant-Based Boost, Nutrition Solutions for Athletes and Exercise Enthusiasts which provide sustainable tasty recipes and the ultimate guide to plant-based living for athletes. Available for presale at a discount for May 21, 2019 release. 1. Food Loss and Waste | USDA. https://www.usda.gov/foodlossandwaste. Accessed February 16, 2019.